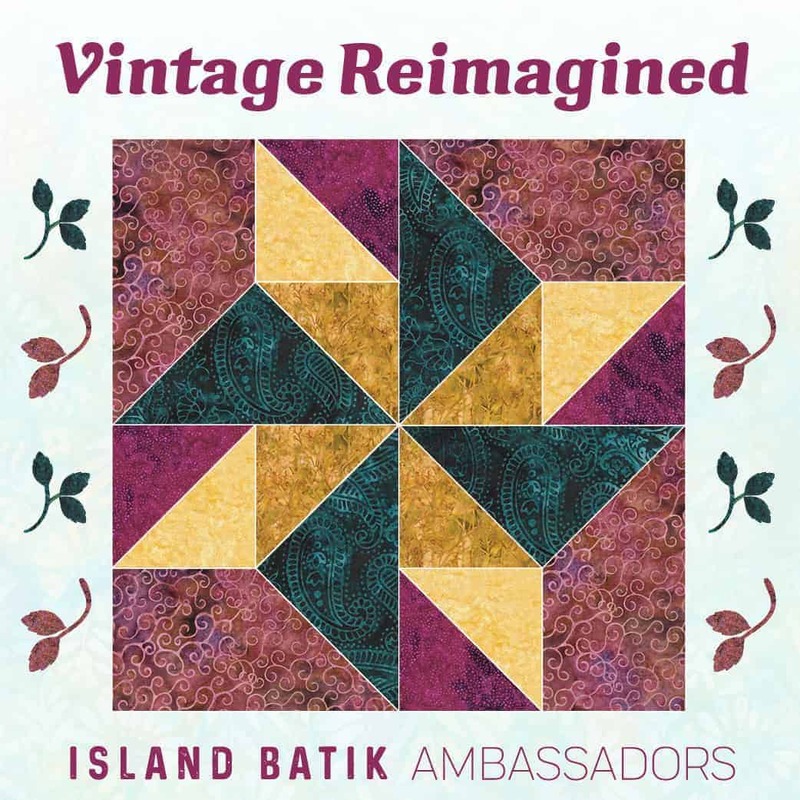 As you may have heard, this month’s Island Batik Challenge for the ambassadors is called Vintage Reimagined. Our charge was to take something from the past and give it a personal touch that is yours. Inspiration can come from anywhere! The Astle-Alpaugh Family Foundation Collection. I began to look through the vast world of the internet. Checkerboard quilts caught my eye, especially the one above. I worked at it for awhile using the check it out fabric I had and some foundations fabrics from Island Batik. (The fabric, batting and thread was given to me by Island Batik). However, the blocks are about 1/2″ square and that made for a teeny tiny quilt. We were to do something in the 36″ square or larger range. Uh oh. Off to the drawing board again….but that meant more internet hunting. Chrome orange, or antimony, was commonly used in appliqué, especially in Pennsylvania, from about 1860 to 1880. Thus, this dye can help to both identify both the date and location in which a quilt was made. This dye was often made in the home from store-bought powder, however, the high lead content of the dye made it (in retrospect) a dangerous substance with which to work. While the color was called antimony or chrome orange in the nineteenth century, historians and collectors often call the color ‘cheddar’ today. 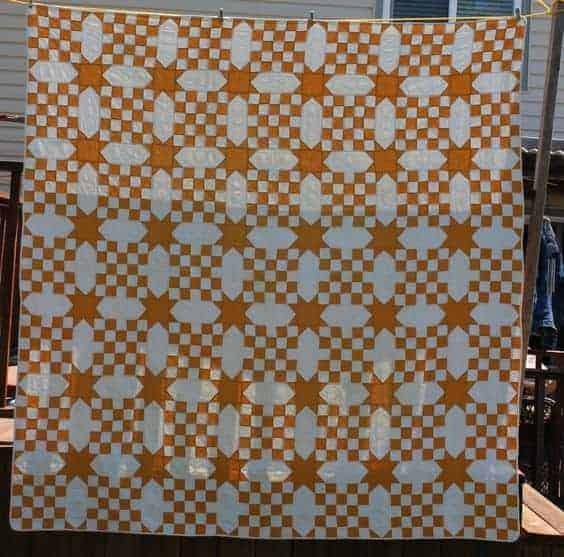 I kept looking for more information but couldn’t find any on this quilt – just that it was for sale on Ebay at some point. I did find these though if you really like Cheddar Orange! Perfect for Spring…. These colors became my choices for my version as I had no cheddar orange check but I had enough pink check and bubblegum pink (I thought – more later on that fiasco) to make it work. Percy’s eye poking out through the hole in my quilt! COUNT your pieces – really! Usually, I am pretty good at math, but something strange is happening. I make these rookie mistakes and then I wind up short on fabric – nearly every other Island Batik project this happens. I was thinking 80 pieces for the star points – wrong. I was using the stitch/flip method that meant no cutting in half, but 160 squares. Don’t trim up your fabric scraps early! I may have had enough to compensate for 2, but I thought I had this in the bag….NOPE. I needed more fabric. I ordered some from Four Pines Quilting . They carry Island Batik Foundations and are in Calremont, New Hampshire. I called to be sure they had it (having been burnt recently by another company), ordered it and I received it promptly. Highly recommended by yours truly. 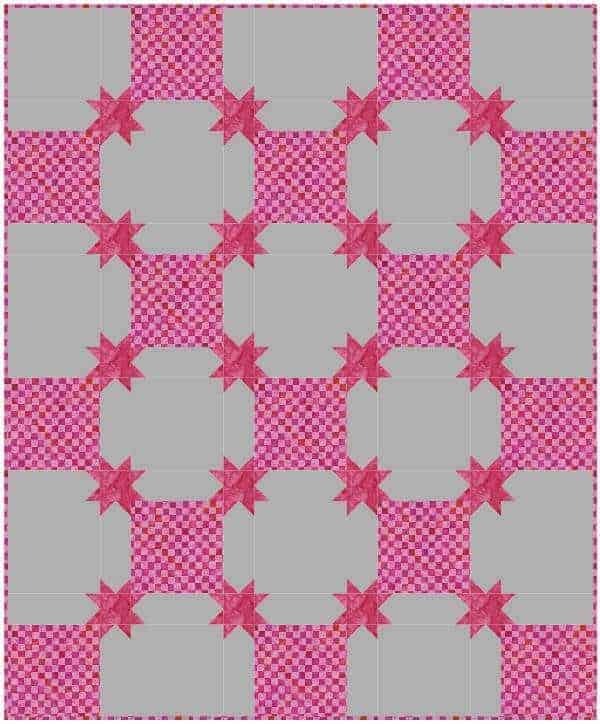 I had fun using my Accuquilt* die. I feel like I want to design all my quilts around this now – it is so easy. 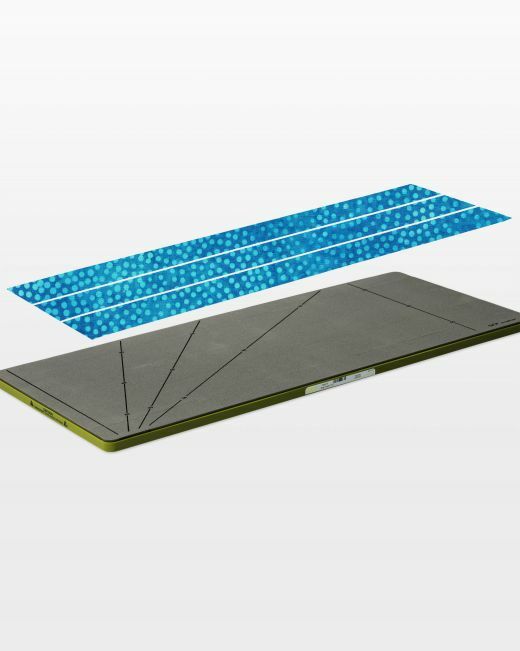 I used it to cut the strips for the 2 1/2″ squares and then subcut the strips into squares by changing the orientation of the strip. I also am using it to cut binding ALL THE TIME. It is a time save, and wastes so little fabric. I am in love with this Go Cutter*. My friend Rose at SomethingRoseMade is always talking up her die cutter; I know why. I use my camera a lot when making decisions on borders and bindings. Here were my 3 choices – the solid pink, the checked pink and the grey. I liked the punch the checked fabric gave the quilt so it won! I wanted something simple but elegant. I need to have more time in the month to play with quilting – this wasn’t the month. I first secured some of the major lines of the quilt with Aurifil “Silver Fox #4670″, a beautiful subtle variegated grey for the back and”Grey #2605” for the top. 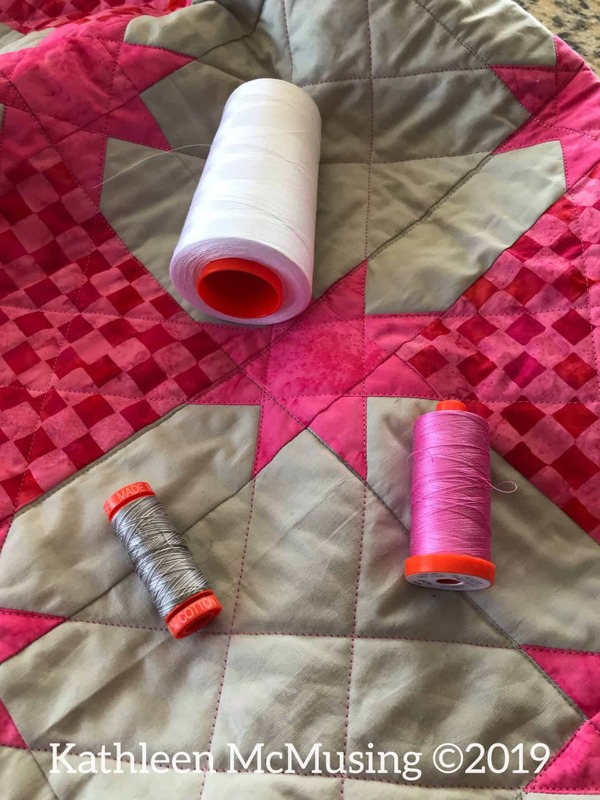 For quilting I turned to the bright pink “Medium Orchid #2479”. It was stunning! And, just to keep it all in the family, I am stilling using a lovely cone of “2024 White”. Aurifil is a generous sponsor of the Island Batik Ambassadors. I also used my Hobbs Cotton Batting* for this project, again another wonderful sponsor of the Island Batik Ambassador program. I love the end result of this vintage reimagined quilt. I think it has a modern feel – more open space and modern bright colors. I felt like this older quilt was too busy, so that the modern sensibility made so much more sense. This was also one of my quarterly goals (here), so I am pleased that it is done on time and early! Busy times and a few things that are coming up! Previous Post A productive week quilting! Kathleen, how ingenious to swap the check for the 25-patches! And I love the hot pink colors. Now, how in the world did Percy get to peeking through that hole? It looks like there’s a door behind the quilt, not a dog. Ingenious, hardly. It is the old cheater cloth but not so in your face as being a cheater cloth. 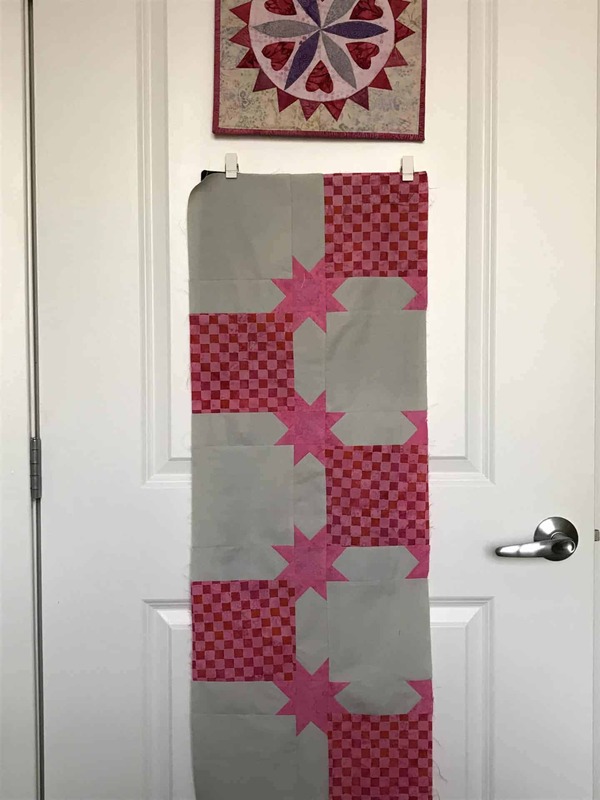 Percy is a quilt on a door – you are right – and I updated my blog to make that clear! How’s Mom? Great quilt! 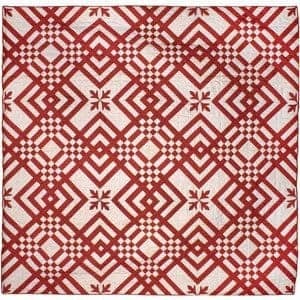 I love the use of the chequerboard fabric in the plain squares!! Thanks, Karen. It was fun fabric to work with. I love your clever take on the vintage quilt. Using the check to replicate the small pieced squares is delightful. Well, there is a good old tradition of cheater cloth, though I hate to call it that so I didn’t. I did put a note in that Percy is a mini quilt hanging on the door – with a reference to its old post. I thought it was pretty funny when it happened. 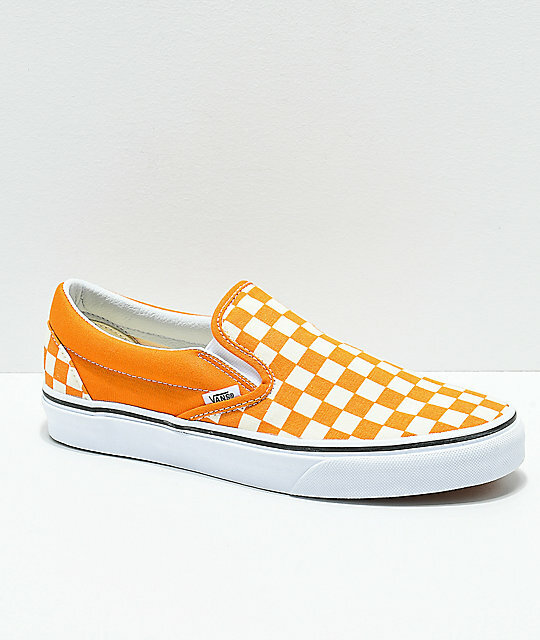 A cheddar quilt is on my bucket list, and if someone offered those shoes to me, I might give in. They aren’t quite my style, but that cheddar might tip the scales. 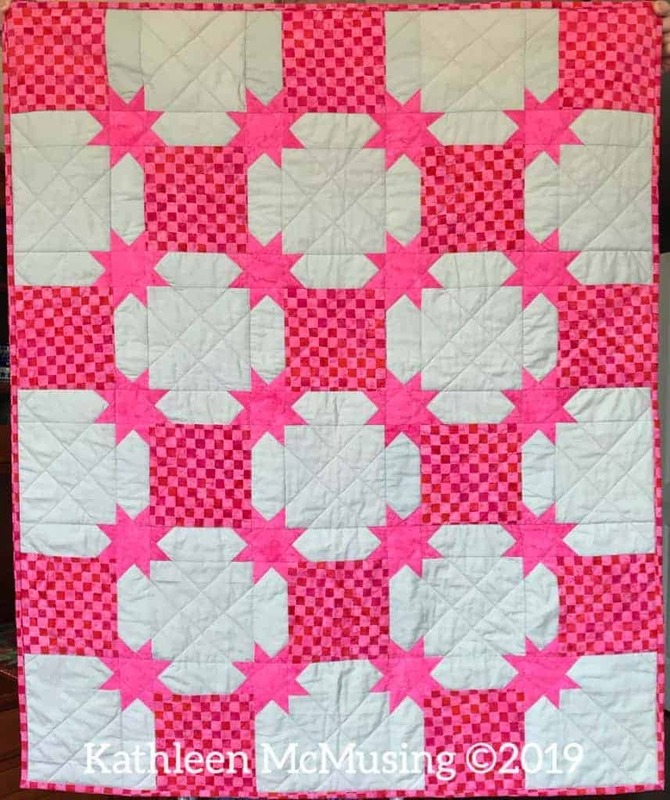 I love the twist you put on this quilt, and the pinks are so bright and happy. I can relate to all of your dilemmas you encountered while making the quilt. Been there, done that. This is a great finish, Kathleen! Hah, I am so glad I found someone who would wear those shoes! The pinks are fun and not in my usual colorway so I enjoyed using them. I am still mystified but planning on being better about it, although I was sure I had this under control! The check is a great idea, instead of piecing that section. I loved using the checks. They are really fun and need interesting ways to be presented! Sorry you had some problems with the math. You are not alone, two quilts I started while on our big road trip didn’t get finished because I didn’t calculate right when cutting before we left. And I didn’t have extra fabric with, grrrr. But glad you were able to get your cute project done! Thanks, Vicki. I am hoping it was momentary and not an aging problem – fat chance. I try to write it all out and check it twice, but maybe thrice is needed. I’m glad its done too – it was fun! I like how you were able to achieve the check look with a fabric; brilliant solution! Somehow, this all fell together in a way that I was really pleased with in the end – even if I had to abandon my first plan. I hesitate to call it cheater cloth as that always seemed to denote ugly fabric. This batik is prettier than any cheater cloth I ever saw. That turned out really pretty! 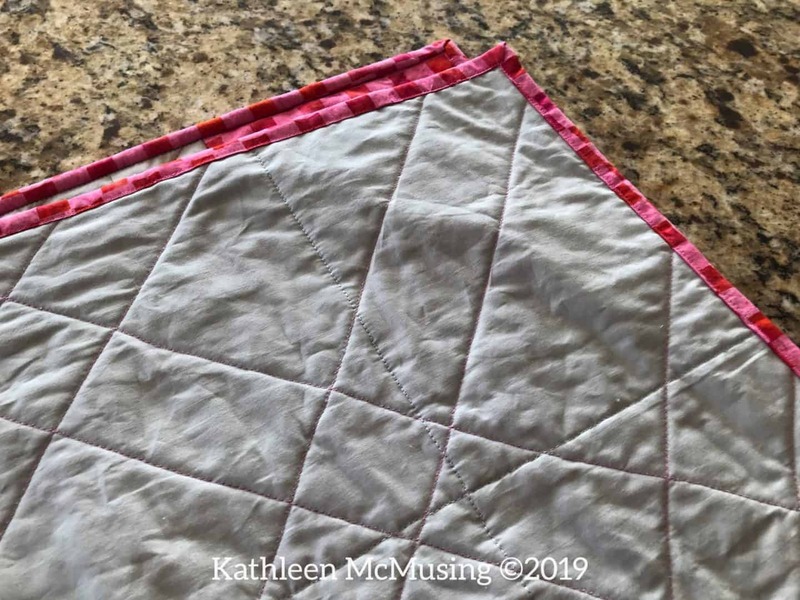 I tend to make a lot of mistakes too – which is why I make scrap quilts so fabric changes can be a part of the charm. I don’t usually make so many mistakes – I am hoping it was a phase. If not, I will need to figure out another approach to making my own designs. Thank you, Roseanne. Those triangles are a little oversized and I think it made the effect more pronounced; the checkerboard fabric may have helped too. Let’s hope it was mercury retrograde for seam rippers – I am so over it! This is just perfect! I love that you worked the checked fabric into the quilt. I’m still scratching my head at what to do with them but you just nailed it. Lovely vintage quilt, reimagined! Thank you, and I know you will come up with something – what color did you get??? Its having the coordinate 1/2 yard that was a big help (and of course I got more to make it work when I made my mistake)! We have to find ways to laugh when we make rookie mistakes. Hoping that was a winter thing and I am all done with it. When fabric is this fabulous, let it shine is what I think! Such a clever idea! I like the quilt a lot! I also had fabric issues with my March challenge….. Someone did say that mercury was retrograde, so maybe that’s the answer. 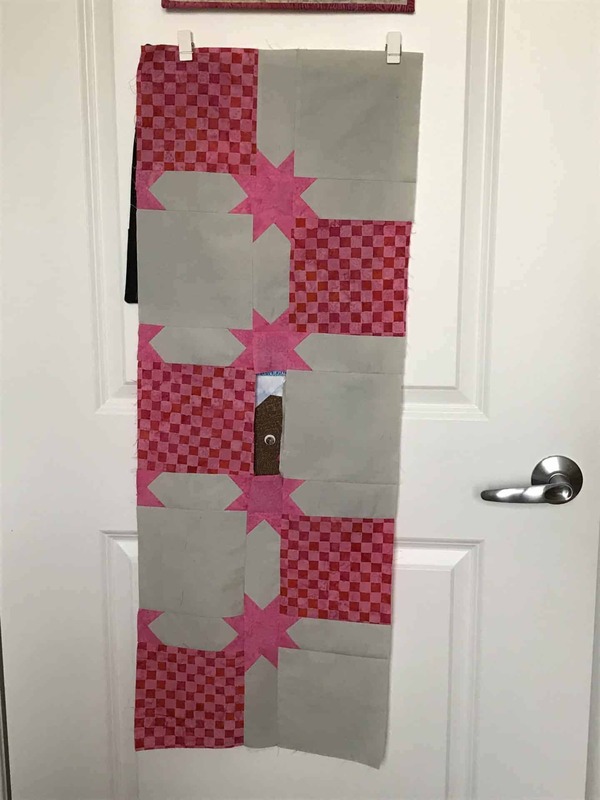 I don’t know but it was an incredibly easy quilt that fought me!! How are you doing? 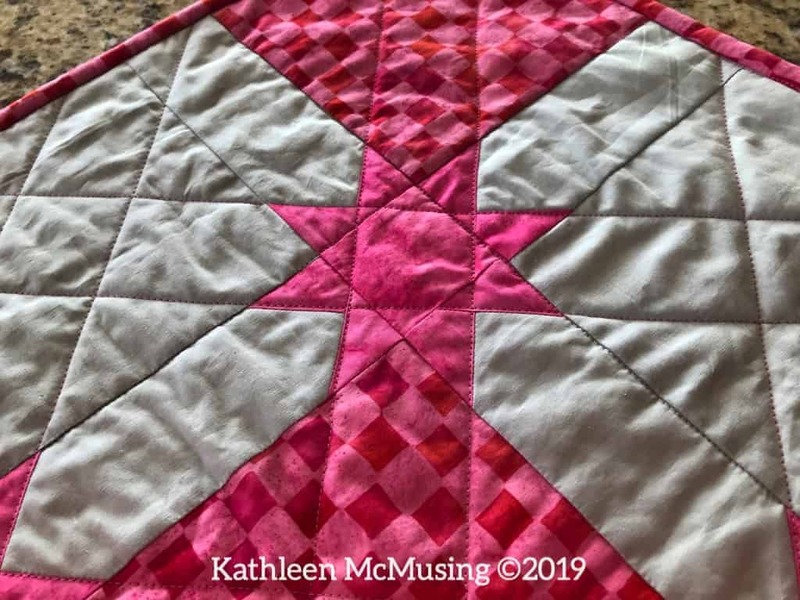 Wow it’s a great quilt Kathleen, and thank you for taking us through the process, and giving us the orange runner pic ha! I blame all the brain farts I make these days on menopause, so annoying. The finish is really a good one, and I do like it better than the vintage original. Those shoes really cracked me up. I heard mercury was retrograde so I am going with that – but it could be menopause. Truly, it used to be easier. I, too, like this better than the original. What a fun way to get the checked effect! I have always thought that even though the ambassador box is very generous, it must be quite a challenge to work within its parameters for each month. So give yourself a pat on the back! I love the challenge – and yes that box is generous. The parameters are what trips me up some months, and then some months it is me! I love your creative process and the quilt. Gorgeous finish Kathleen! I love the use of the checked fabric. Interesting to see a batik in a check. This is such a nice interpretation of a vintage makeover. Sorry to read about the fabric issues tho! That sounds like a mistake I would easily make. We are so used to getting two triangles out of each square. Glad you were able to get more fabric! Its amazing how easy it is to do. Honestly, on this I just counted wrong. I knew I was using squares and just multiplied the pieces by 2 rather than 4. Hopefully, I have learned my lesson. Such a lovely quilt! Really like both of your inspirations. It seems you learned a lot with this one! So sorry! The result though is lovely. Thanks for sharing on Wednesday Wait Loss. Congrats on finishing another goal! I love how you used Check it Out fabric to interpret the Vintage quilt. Thanks for the tips to count, keep scraps and pay attention while sewing. These are good reminders.